Although acne doesn't pose a serious risk to a person's health, it causes enormous distress to those affected because of the unsightly nature of this condition. That is why people try to treat acne frantically as it otherwise may even lower their self-esteem. In this article, we will attempt to find out the various ways of treating acne and analyze the advantages and drawbacks of these. If it is a minor outbreak, you could try treating acne with some over the counter creams and see if they work (in most cases the acne makes a comeback because conventional medications just treat the symptoms without treating the real causes). If they don't, you will have to decide on whether you go in for prescribed drugs and creams or whether you try the naturist way of curing your condition. If prescription medication is your treatment of choice, you will probably be administered Isotretonoin, antibiotics, Retin-A or oral contraceptives (if you are a woman). We will briefly discuss the details of these drugs and tell you what they are used for. Isotretonoin is an oral medicine that is prescribed in cases of very severe acne . However, you must keep in mind that this drug has very serious side-effects. These include severe depression, psychosis and, in some extreme cases, even suicidal tendencies. Also, it could adversely affect pregnant women and cause defects in their unborn fetuses. Antibiotics are generally used to fight bacteria which may be present on our skin. While a bacterium does not cause acne, it does engineer the formation of infection which ultimately leads to acne. However, with time, some bacteria grow immune to it and it then ceases to have any effect. Also, antibiotics sometimes lead to vaginal yeast infections in women. Retin-A, a derivative of Vitamin A is widely used to tackle whiteheads and blackheads but takes a fairly long time to work. And oral contraceptives are administered to women who suffer bouts of acne during their menstrual periods. While it helps, it does also lead to irregular bleeding, breast tenderness, weight gain or loss and mood swings. Other than causing the side effects, these medicines also cannot cure acne because they cannot take on all its causes which can be many. Instead of trying to control the production of sebum and eradicating the toxins, they just heal the symptoms. If however, you wish to try naturist practices for treating acne, you would first have to change your dietary pattern. Meat, dairy products, caffeine and soda are strictly taboo and you are advised to partake of fish, fruits such as apples, oranges and grapes and plenty of vegetables. You are also asked to drink at least 64 ounces of water every day. You should apply Aloe Vera directly on the affected parts as this accelerates the healing process. 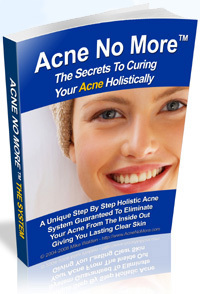 However, whatever method you choose to employ in treating acne, you must realize that both these methods treat your condition from the outside. Therefore, the disappearance of this affliction could be only temporary as the root cause still lies untreated within. This is where the holistic approach outscores the others. It tries to repair the root of the problem from within by asking you to change your whole lifestyle. If you are prepared to do this, choose the holistic approach. It is the only one which will give you permanent relief.